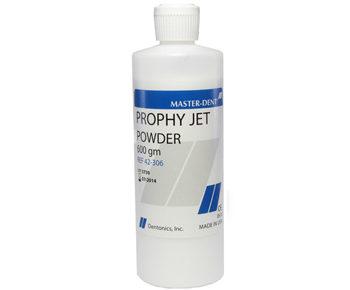 Master-Dent® Prophy Powder is a white, flavored free flowing powder for professional prophylaxis procedures. Used with an air polishing system, the Prophy Powder provides effective plaque and stain removal for shade determination and placement of sealants. It is also used prior to fluoride treatment or whitening procedures; surface preparation prior to bonding/cementation of inlays onlays, crowns and veneers or placing composite restorations. Used for cleaning prior to bonding orthodontic brackets.